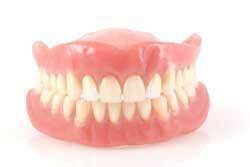 A full denture is made when all the natural teeth are missing. It is fitted to replace the upper teeth, lower teeth or both. NewDentures should not cause pain, nor look unnatural, interfere with speech or stop you from eating your favorite foods. We use a method that ensures a fit that is superior to traditional methods of denture construction. We use the highest quality artificial teeth to individually match to you for a natural appearance. 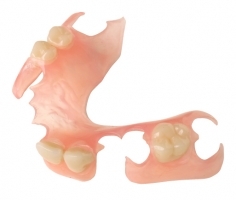 Using the latest techniques, and modern technology, we can construct your dentures for a functional and comfortable fit. Your face shape and complexion, comfort and function are important considerations when choosing teeth for your denture. By choosing the correct shape and sized teeth for your mouth and setting the teeth correctly we can ensure a natural appearance. Are constructed using the same acrylic that is used for the construction of full dentures and use S/S wire for the clasps (clips) that wrap around the teeth. Additional teeth are easily added and fractures or breakages are easier to fix and less expensive compared to CoCr partials. 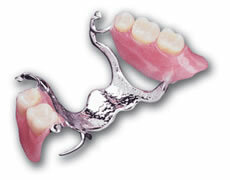 Is a cast metal framework to which the teeth are attached. The clasps are cast as one with the framework. This makes the denture stronger, slimmer and less prone to breakage. 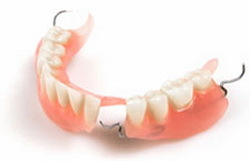 This type of denture bares the biting forces on the natural teeth rather than the gums â€“ this helps keep gums healthy.